seems to have turned into a virus. A head cold, actually. Not influenza. Which is good, because the flu knocked me back about three weeks winter quarter. But this is bad enough. Didn’t study at all yesterday, just sat around in bed mostly, playing computer games because I couldn’t concentrate well enough between coughs and sneezes to read or think. Oh. And I napped… I suspect I will repeat this performance for Saturday (today) if I ever manage to fall asleep. Until then, I am surfing the web and looking at my blogroll. A new category is in order, I think, anticipating the summer. Art Blogs. The first will be Art Projects for Kids, something that my friend Robin linked to a few days ago. It’s not just adults who are interested and engaged in these times. and Slate Magazine invited its reading to craft aninvitational inauguration speech. and here is how Obama inspired someone overseas, writing in The Daily Telegraph. I LOVE the way WITS (Writers in the Schools), based in Houston, Texas, supports and promotes literacy and writing. I periodically visit this blog that has a poem written by a child each day. There is so much talent, so much sharing that goes on! It makes my mama/teacher/writer/human heart glad. Today only (Nov 25) there is a contest for people that will give an Amazon.com gift certificate to a random reader who mentions a poem they have enjoyed reading on the WITS blog. Finding one’s voice is a major goal of growing up. WITS provides children with an opportunity to learn from published authors and participate in activities that help them develop their voice. Want to get involved but don’t live near a WITS program? This is an idea that might encourage you: find a local school — or a library — with a need for adults to read with children, a need for people to listen to children read. Half an hour a week… or every other week. Take some time. Make a Difference. A few links to sites about the voting that is going on in the United States today. Here is one in Spanish, I followed a link and followed a link and found La Nation’s Website with a blog attached. Here is a link to the local newspaper for Thurston County Washington (also read by people in Shelton/Mason County and the northern edge of Lewis County): A Historic Day. CNN’s website will have plenty to say today… check out specifically the Politics section. And if you are following state-wide ballot issues in your area, CNN also has ballot issues for all states that will track the results as they come in. Yes, I voted. Dropped my ballot in the box yesterday, in fact. I am optimistic that most of the races will result in reasonably intelligent, conscientious people gaining office… we were lucky in our state and local races to generally have good candidates no matter who you voted for. Except in a couple races, where I really have my fingers crossed about the results. And now, back to our regularly scheduled programming… COMPOST PROJECT (details to come). Four days to go. Here is CNN’s site that is devoted to helping people. I picked the page on Poverty to start, but there are many other topics linked to as well. 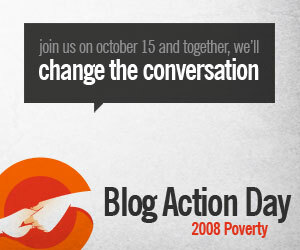 I have signed up to participate in the Blog Action Day. The theme is Poverty, not sure what I will write, but I’ll come up with something!